Seen on 13 August 1967 beside the superb gardens at Southsea seafront is Portsmouth Corporation No.59, GTP 976, one of a batch of twenty five Leyland PD2/10 buses with Leyland H30/26R bodywork delivered in 1952. No.59 was withdrawn in 1969, and the last of this batch went in 1971. My childhood trips to Southsea in the late 1940s/early 1950s were always undertaken by trolleybus, a memory to savour, and it is a matter of personal regret that I didn’t manage to capture a picture of one of the trolleys before the system closed in July 1963.
International Progressive Coachline bought some of these for use on contract work in the early 70’s . Their yard was at Waterbeach near Cambridge. There are a few photos of their buses and coaches on this web site already. The owner was ‘Paddy’Harris, and the manager was Barry Parsisson. I worked for them briefly in 1972, but after a few months went back to ECOC for an easier life, and less stress ! After many years, the sole survivor of this batch, GTP 975, has turned up safe and reasonable well. As a schoolboy it was always nice to have one of these beauties turn up as a school relief. 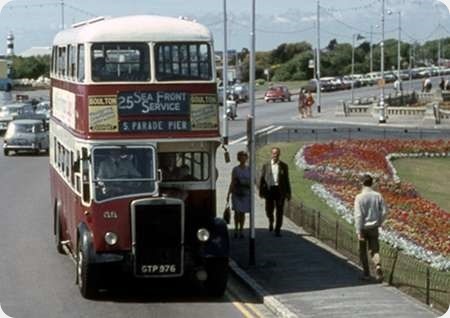 As this is a warm sunny day, without a need for a covered-top bus, I imagine that it was an extra covering the busiest part of the route between Clarence Pier and South Parade Pier, rather that going on to Hayling Ferry. The Farington body was very handsome and looked good in Portsmouth’s livery, especially with the white rather than the earlier grey roof. You may have missed snapping a Pompey trolleybus, Roger, but at least you can console yourself with the colour one I posted on this website, long ago.